andrewlucking.com » summer ‘05 building has officially begun! summer ‘05 building has officially begun! I put in the first full (well, nearly full) day in the hayloft on the weekend. Everything came through the winter down time just fine (no nests in the boat) and it was nice to get back to it. I had missed the smell of epoxy but have to admit to being a little more cautious with exposure to the stuff since reading of kdog’s allergy woes on the bateau2.com builder’s forum. Epoxy allergies appear to be fairly rare but it seems like a wise idea to wear gloves and avoid any fumes (I actually find the epoxy resin to have a very low odour). Here’s hoping he’ll find a way to get his boat finished. 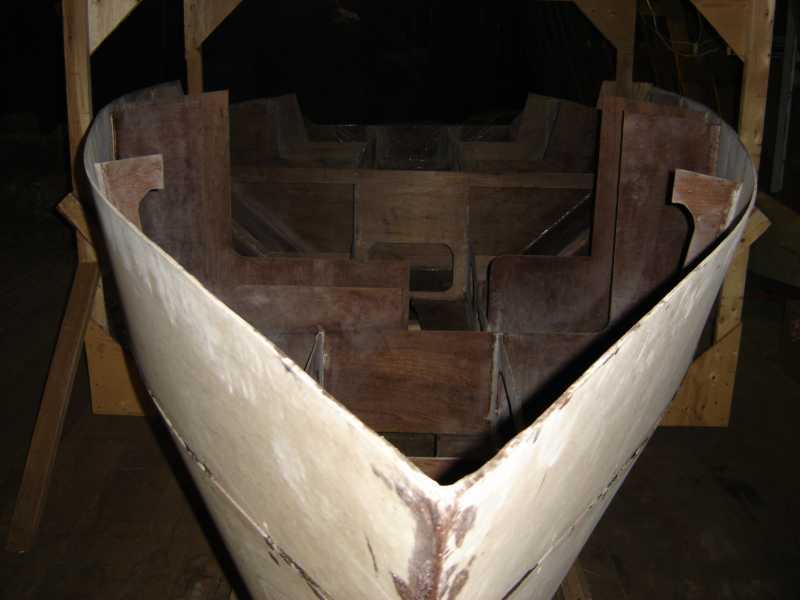 As for the Vagabond in the hayloft, my first order of business is to finish fibreglass taping the stringers and bulkheads in the hull. For some reason all winter I thought that I had only about 1/3 of that task left to be done. Turns out I’d only done about 1/3 of it. Perhaps instead of building nests in the hull critters were undoing my work? A whole month and no updates! We want to see your progress. How go things for you Steve? Thinking about going for that sweet looking VG25? I’ll have to wait for the study plans before I make that decision. Construction space is the big problem. I have thought of putting a cabin on the VG23 that is almost identical to the VG25’s. Of course it would only give me 5′7″ head room but that would be better than 57 inches. I am also contemplating extending the VG23 cabin by 1.5 feet. Those ideas may not be practical after I really view the plans for the VG23 but at this point I like to think it can be done without too much weight increase. I want the galley in the aft cabin so you can stand with your head out the hatch and cook. A fridge on the opposite port side would be nice too. I have plans to spend a LOT of weekends aboard and want as many creature comforts as possible. Since you can build fresh water tanks and waste tanks of plywood and epoxy construction I might try a plywood epoxy fridge with lots of foam for insulation. Keep up the good work.